Thank you for your interest in our Slovak American Cookbook. In 2010, the First Catholic Slovak Ladies Association worked diligently to improve the print quality of the book. 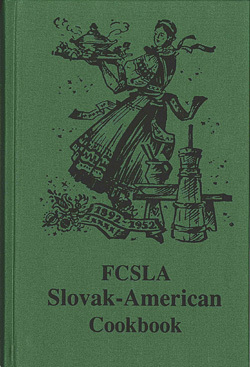 The newly reprinted Slovak American Cookbook still contains the traditional Slovak recipes that were first published in the original edition over a half of century ago. We are proud to say with over a quarter of a million sold, the cookbook is in its 26th printing. The FCSLA offers the cookbook as one of the ways we promote and preserve our Slovak heritage and culture among our members and community. Chosen by Town and Country magazine as part of its feature article on American's Best Community Cookbooks, and was named the best cookbook from Ohio. Made the top listing when reviewed by Cuisine magazine. In 1976, National Secretary Frances Mizenko presented a copy to President Gerald Ford. His acceptance response? "Betty will love it!" We accept checks or money orders made payable to First Catholic Slovak Ladies Association. We are not responsible for cash enclosed, and we do not ship C.O.D.